Welcome to the second reveal of Bead Soup Blog Party #7. Actually, this is my first blog hop. When I started I didn’t even know what a blog hop was, but I hopped in with both feet. Thanks to Lee Anne ( the metal girl ) who encouraged me throughout this process and Sandra who kept me in line ( as best she could). These ladies are like sisters to me. I love them dearly. Still, I wasn’t sure what I had gotten myself into. You see, I am a Muscogee Creek Indian. My heritage plays a big part in my jewelry design. Whenever possible, I prefer to work with natural stones, nuts, copper, shells, horn, teeth and BONES, things that are Organic and of the Earth. It took me a long time to make a decision about what I would send my soup partner. I knew I wanted to send her a little piece of me. Luckily for me, Lori Anderson gave me the best soup partner ever—Mimi Gardner. From the beginning we connected. I love her work and I wanted to make sure she had a wide variety of materials. 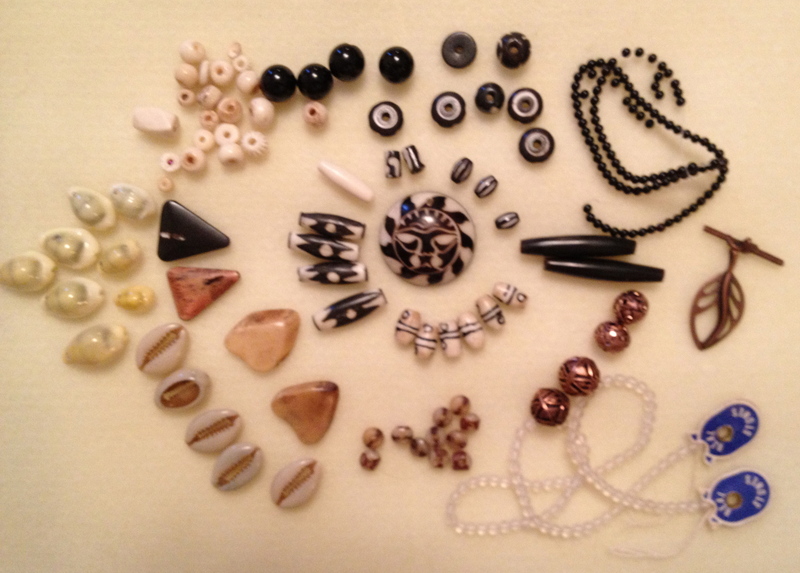 I sent her a variety of tagua nuts, seeds, shells, vintage black onyx, vintage frosted quartz, some bone and horn and a carved tagua nut focal, all in black and white. Did you see what Mimi sent me? 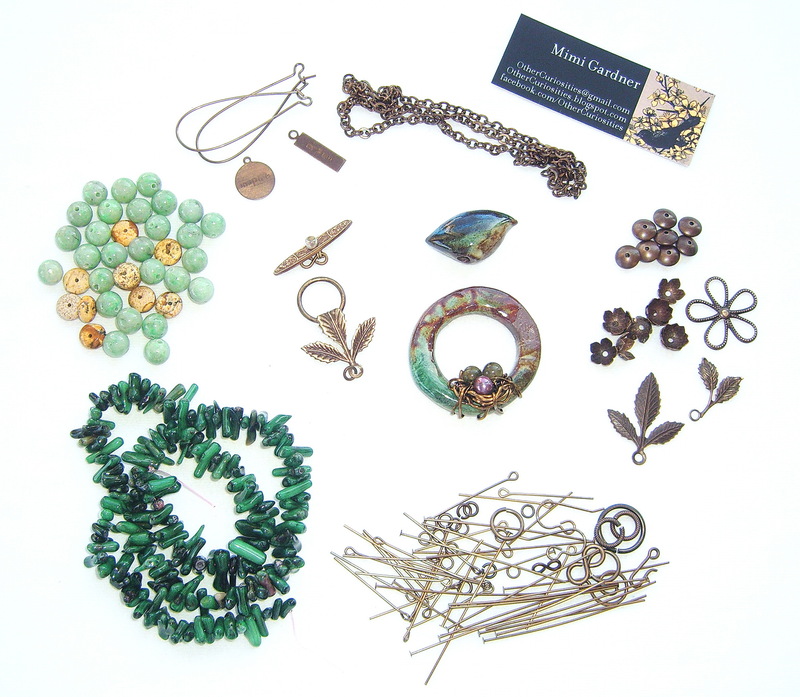 In my box was a beautiful selection of coral, jade and jasper beads, chain, brass findings—including a clasp made by Mimi—and TWO handmade focals—a ceramic bird and a matching ceramic ring with a nice little nest wired to it. There’s a picture below. See all the beautiful beads she sent! taking it apart and putting it back in the box. My friends will tell you this is what I do. Yeah, I KNOW. The reveal date was getting closer and I didn’t have anything. Then, one day I made up my mind. This was going to be the day. I realized I was leaving myself out of the piece. I dug through my own beads and began to add bone, seeds, and some wood. I had some nice dragon’s blood coral that I used to frame the focal. I LIKE this! Pretty soon I was done with my first piece. Here’s the necklace I made. This was just the beginning. Mimi sent me so much that I just kept creating. I added a wooden “face” focal with the jade she sent, Sprinkled in some of the jasper and a few seeds here and there. I topped it off with some copper and VOILA’ !! What do you think? I love this one.. I made a couple of pairs of earrings to go with this necklace. So now I’m on a roll. I still have the Jade left in my box of goodies. 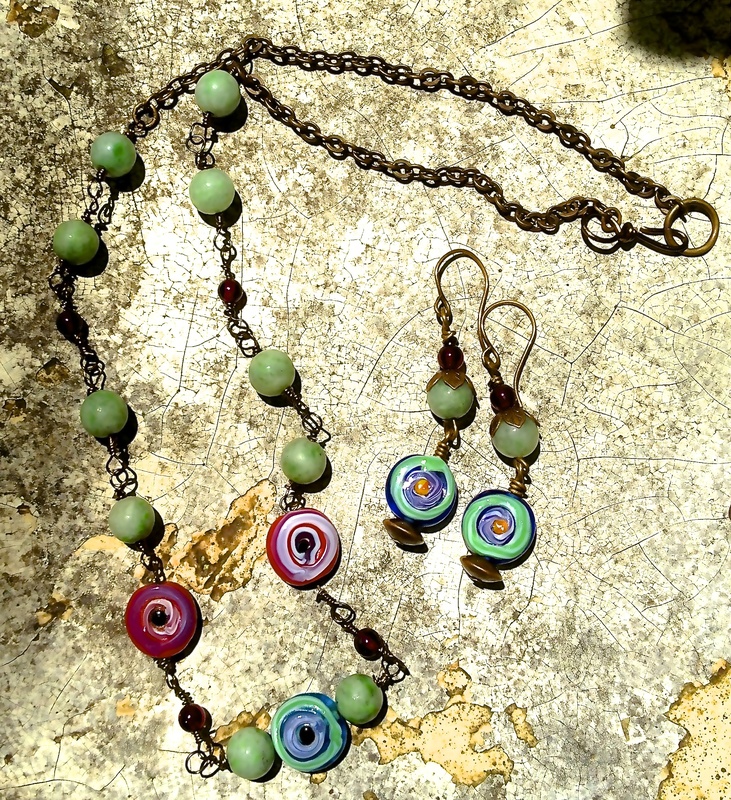 I added some pretty glass beads I traded Lee Anne for. I used the chain from Mimi. 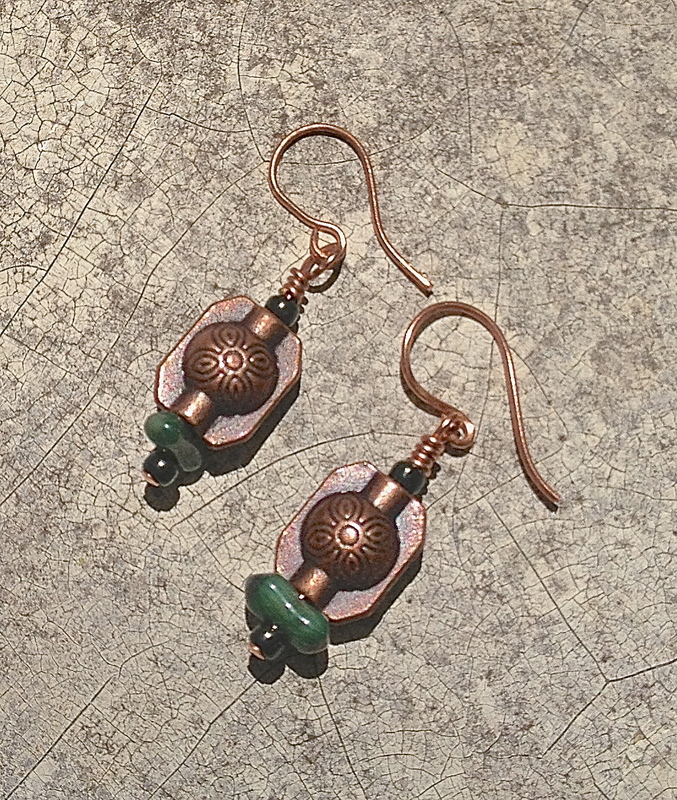 I needed earrings to match so I made some magic and this is what I made…. I still have some ingredients left in my box of goodies so i’m sure i’ll be posting more. Again, Thank you Mimi Gardner for all the love. I am so lucky to have you as a new friend. A sister. Thank you for challenging me in such a wonderful way. You helped make me a better designer. Please take the time to check out the other chefs in this reveal. Love that first piece. LOVELOVELOVE Well done! Thank You Juli. That means so much. They are all lovely, I like the “Wooden Face” necklace the best! Thank you for the wonderful wishes and words. Brandi. I want! What a fabulous soup, your designs are wonderful. I was so lucky to be partnered with Mimi. Thank you. I love your style, these pieces are so original! Susan, I am totally blown away! You created pieces that used the ingredients you were sent, and yet are so filled with your incredible spirit. I love them all, and am so glad Lori brought us together my new friend! Thank you Mimi, You gave me such beautiful things to work with. I will wear them and always remember my new friend. Thank you Lori. Wonderful post! And all of your designs look great! So glad we did the Bead Soup together.. and thanks for the “bump”..:) off to see what Mimi has made and the others. Thank you Lee Anne for all your help and support. I love you dearly. Thank you so much Bailaora !! Love the jewelry you made with your soup. Thank you Delores. It was fun to make. Love the earthy colors but also the design. All of them. Beautiful work, Suzan! 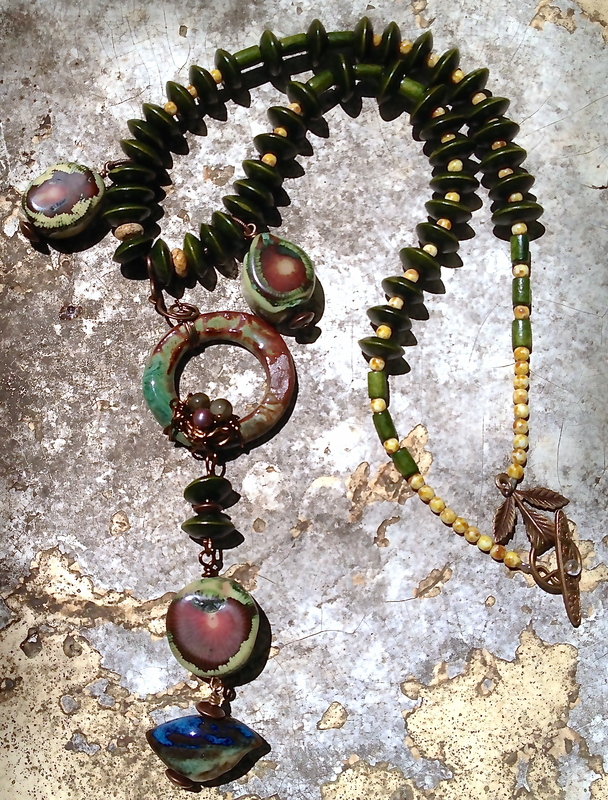 Especially the first necklace – it’s earthy look catches my attention immediatly. Love those warm colours in it! Susan you really rocked that first necklace and the last pair of earrings are gorgeous. Michi, I really enjoyed making them. Thanks for stopping by. Even if it took a few stops and starts to get going, you made some really fun pieces! The last necklace is so cute with the pops of color! Oh my Susan….what beauty! 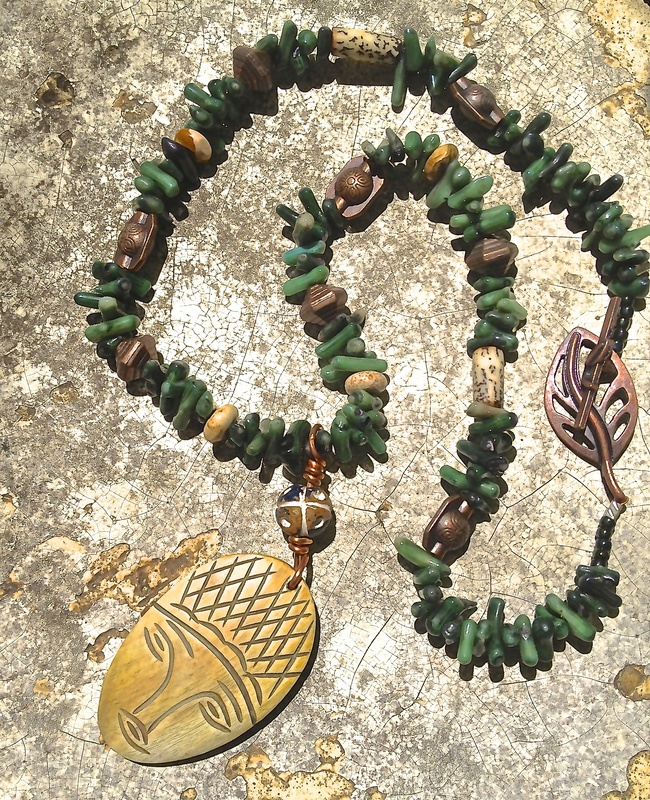 I really love the face bead necklace! Awesome work! Veralynne, I enjoyed making them. I had great beads to work with. I like that first necklace so much, it touches my soul deeply! Margareta, That one was especially fun to make. that last set reminds me of candy 🙂 Love all your pieces. Great job. Very fun pieces! Looks like you really enjoyed working with your soup! Well Susan, I must say you have a lot of great new pieces to wear now. I especially love the first piece. It has a woodland feel that draws me to it. Wow what a way to get yourself started with blog hopping! I really love how you combined the focals in the first necklace and all the texture makes it so pretty. You really brought it all to life. I’m on the 3rd reveal, I’m partecipating for the 3rd time on BSBP… so much fun! There is so much variety in your Bead Soup creations and I love them all! I love what you made with your soup. While the materials may or may not have been something you were used to working with, the influence of your heritage still managed to come through. Beautiful work. Great job! I really like how you were able to give everything such a . . .tribal-like feel. I would not have thought that was possible with the soup you received, but you really didn’t let that stop you. Wonderful work! Don’t you just love it when the ideas keep popping up in your head? I really, really love that first necklace, it just totally grabbed my attention. 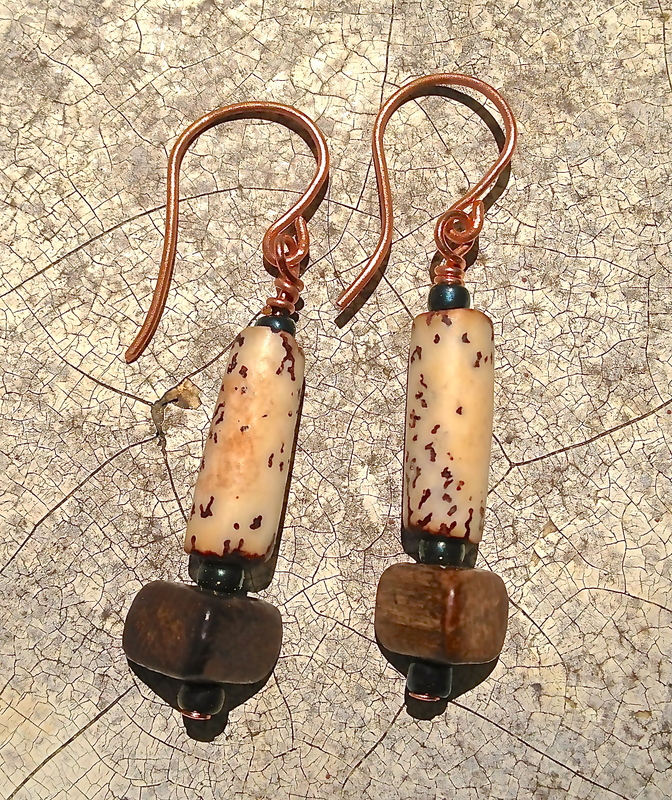 And since I struggle with earrings, I’m always looking for inspiration for them. Yours are definitely in that category! Great job!! All your pieces are stunning! Great colors and design…Fantastic job!